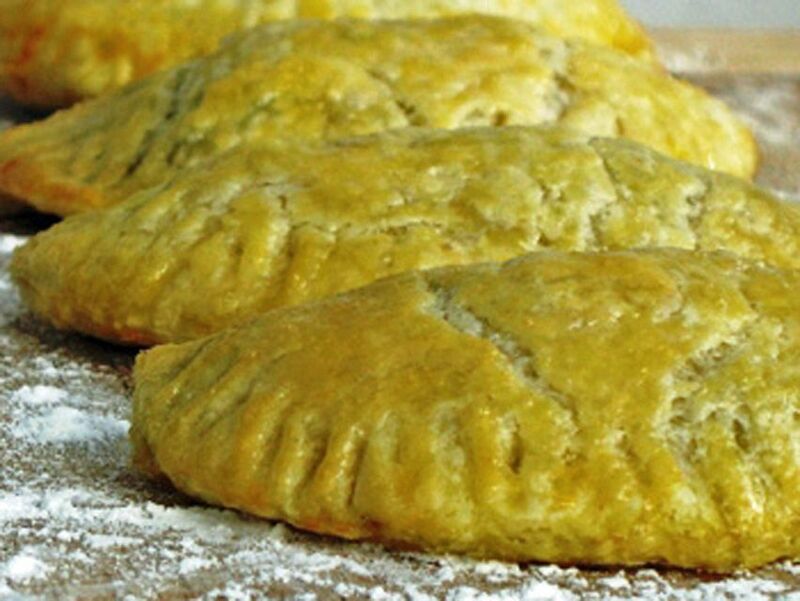 If you've traveled in Asia, you'll no doubt have come across snack-sized pastries filled with meat and/or vegetables - what is sometimes known as a "curry puff". This Thai version is fun to make and includes tips on how to create flaky pastry quickly and easily. While in Thailand these chicken pastries would be deep-fried, here I'm saving calories and fat by baking them - I find they're just delicious. Wonderful any time of day - my husband loves them for breakfast or brunch - but they're also great for lunch (easy to take to work), or add a side salad and enjoy them for dinner. If you don't have a food processor: ​Use a knife and fork to cut the butter into the flour and salt until you have small butter pieces. Next, "rub" the pieces of butter between your fingers into the flour until the mixture resembles course oatmeal. If you have a food processor: ​(this is the best way to make the pastry, since touching the dough is what causes it to lose its flakiness): Place all pastry ingredients together in your processor and blitz until the mixture looks like course oatmeal. Using your hands, make a ball of dough out of the mixture, gently packing it together and handling it as little as possible (do not kneed it). If it feels too wet, add a little more flour; if too dry (falling apart), add a little more water. Place in a plastic bag or wrap and leave in the refrigerator while you make the filling. ​Stir-fry the onion and garlic in 2 tablespoon oil for 1 minute. Add the chicken, yam, half of the chicken broth, plus the curry powder and cayenne. Stir-fry 2-3 minutes. Add the remaining broth plus the peas, sugar, fish sauce, and coconut milk, stirring well to incorporate. Cook for another 3-5 minutes, stirring occasionally until the yam is soft. Remove from heat and do a taste-test for salt, adding more fish sauce if not salty enough. (If too salty, add a squeeze of lime or lemon juice). Set aside. Remove half the pastry from refrigerator. Using a rolling pin, roll out on a flour-dusted countertop until the pastry is fairly thin (or the thickness you prefer). Use an overturned dessert bowl, ramekin, or wide-mouthed glass to cut circles out of the dough (I use a ramekin that is 4 inches/10 cm wide). Place a little filling in the middle, then fold the dough over to create half-moon shaped pastries. Gently press the edges together. Dip a fork in cold water and press the end along the seam to create a decorative edge (this will also help seal the pastry). Bake at 350 F on ungreased baking sheet for 30 minutes. Optional Step: Before baking, I brush the pastries with a little-beaten egg. This gives them a nice golden color and professional-looking finish.